The Cardiff University/Cardiff Half Marathon has grown into one of the largest road races in the United Kingdom. The first event took place back in 2003. The event is not only the UK’s second largest half marathon, it is Wales’ largest road race and Wales’ largest multi-charity fund raising event. The race is sponsored by Cardiff University and supported by strategic partners Cardiff Council, Vale of Glamorgan Council and Welsh Athletics. The size of the field has dramatically expanded during the race’s history; from just under 1,500 runners in 2003 to 22,000 in 2016. The course played host to the IAAF/Cardiff University World Half Marathon Championships in March 2016, where Britain’s Mo Farah won a bronze medal and Kenya’s Geoffrey Kamworor won back-to-back World Half Marathon titles. In the women’s race Peres Jepchirchir led a Kenyan clean sweep in the women’s event. The Cardiff University/Cardiff Half Marathon is now host to the Welsh Half Marathon Championships,recognizing Wales’s best athletes. 2014’s winners were Emma Wookey (Lliswerry Runners) with a time of 75.56, whilst Ieuan Thomas (Cardiff AAC) secured top spot with a time of 65.40. The event attracts the world’s top runners. The Cardiff Half event record was smashed in the men’s field in 2013 when Loitarakwai Lengurisi – in his first race outside of his home country of Kenya – recorded a time of 61:51. British athlete Susan Partridge still retains the course record in the women’s field with her time of 1:11:10 in 2012. Thousands of runners raise money for charity by getting sponsored, with more than £2.4 million raised for 800 charities and good causes each year. We’d like to thank all the partners, athletes, sponsors and volunteers who make this event possible and help it go from strength to strength every year. The Cardiff University/Cardiff Half Marathon is proud to be a member of AIMS (Association of International Marathons and Distance Races), featuring as part of a long list of international distance running events. The Cardiff University/Cardiff Half Marathon was awarded an IAAF Bronze Label in 2016. The route takes runners past the capital’s most iconic landmarks with beautiful scenery and historic buildings. The predominately flat and fast course makes it ideal for beginners and elites. 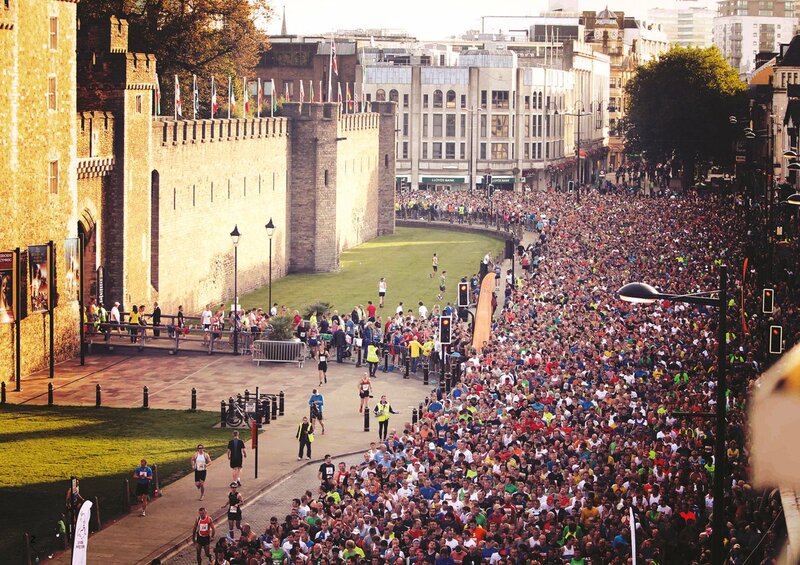 The race starts outside Cardiff Castle and runners then head down past Cardiff City Stadium on the way to Penarth. They take in the glorious Penarth Marina before crossing the barrage and heading to Cardiff Bay. Runners run right through the heart of the bay taking in the Norwegian Church and Wales Millennium Center. The course then heads towards the north of the city and runners will complete a loop of the beautiful Roath Park Lake before the grandstand finish in the heart of the city at the Civic Center. Cardiff, Wales’ Capital city, offers a startling range of unique attractions, top class entertainment and quality shopping– all within walking distance. Innovative architecture sits alongside historic buildings and Cardiff Bay offers entertainment for everyone.